I don't know how easy it will be to find this outside of academic circles (my library copy came in an unmarked DVD holder with a homemade, bootleg-looking insert typed out in Spanish), but it's definitely worth tracking down if you get the chance. 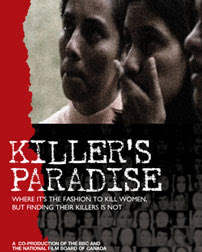 Apparently first aired on the BBC's This World program a few years back, Killer's Paradise (Spanish title: Paraíso de asesinos) has to do with the ongoing murder spree against women in Guatemala that claimed over two thousand lives in the five years before the movie was made--with an average of two a day in Guatemala City alone (10 times Britain's rate). Although male murder victims outnumbered female victims by a ratio of 8 to 1 at the time of the documentary's shooting, producer/director Portenier and journalist/narrator Olenka Frenkiel point out that the number of women murdered had quadrupled in just the last three years. While these are grim statistics by anyone's standards, the filmed interviews with family members of the victims reveal the horror of the individual tragedies in a way that statistics alone simply can't. 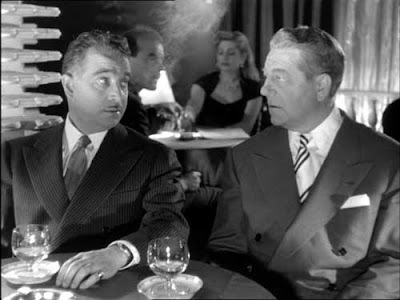 "It's the fashion here to murder women," laments the husband of one victim resigned to the knowledge that his wife's killer will never be caught. "There's no safety in this day and age." In another moment, the brother of a slain college student rails against the police for their blame the victim mentality towards girls and women: "That's how they see the victims. 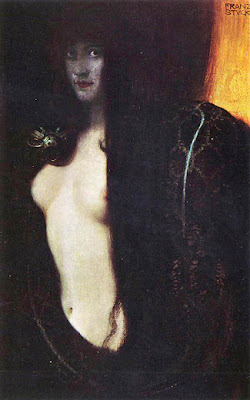 As nobodies. It shouldn't be like that." Fearing reprisals, the single mother of a recently-slain teenager asks a "favor" of the two police who come to make a token investigation of her daughter's death--not to investigate at all "because my other children are still alive, and so am I." Elsewhere, the father of yet another young innocent confronts the bloody clothes his daughter was wearing on the day she was kidnapped and shot and sobs, "Here in Guatemala, there is so much impunity." If any of you book-lovers out there were wondering what "we" here at Caravana would be reading in October while the world economy crashed and burned, this must be your lucky day. 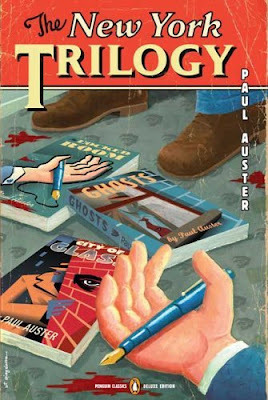 I'm only two chapters into the Auster novella thus far, so I'll have to postpone any comments on this first third of his New York Trilogy until later. I have read big chunks of both the Bolaño and the Fresan doorstoppers (clocking in at 1127 and 539 pages respectively), though, and feel confident they will be huge faves by the time I'm done with them. Fantastic writers! Breathless prose!! Updates soon!!! Un bien intencionado pero bastante cursi homenaje a la República Española. 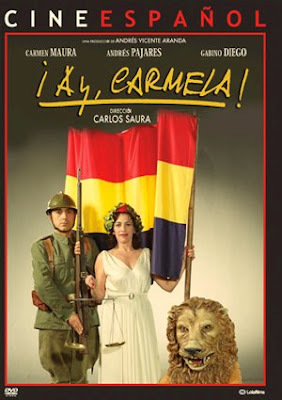 Carmela (Carmen Maura), Paulino (Andrés Pajares) y Gustavete (Gabino Diego) son tres artistas ambulantes contratados para dar una representación para los republicanos en pleno frente de Aragón en el año 1.938. Después del show, preocupados por la guerra, los tres deciden andar a la seguridad de Valencia--pero se pierden en la "zona nacional", donde se convierten en presos de los franquistas. Una oportunidad para salvar el pellejo se presenta cuando un soldado italiano, Teniente Ripamonte (Maurizio Di Razza), les ofrece la oportunidad de hacer una obra de teatro en cambio de su libertad. ¿El dilema? 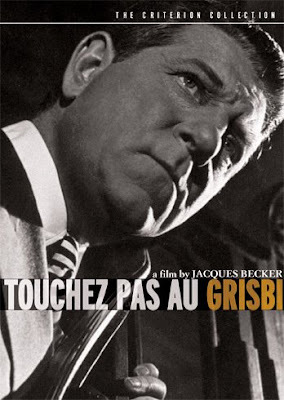 La obra incluirá temas fascistas para humillar a los otros presos políticos (miembros de las brigadas internacionales, el gobierno local, etc.) antes de su muerte por pelotón de ejecución la mañana siguiente. ¿El desenlace? Previsible. 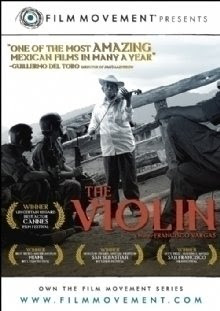 No veo tantas películas mexicanas como me gustaría, pero El violín es de primerísima categoría. 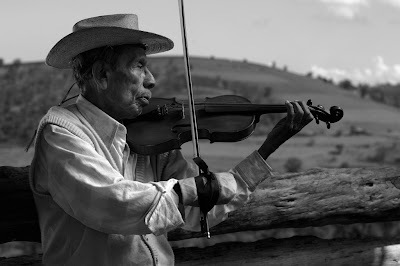 Aunque tiene que ver con una guerra "zapatista" entre los campesinos y el ejército mexicano, se nota que nunca menciona explícitamente ni el lugar ni el tiempo de la acción. En cambio, el cineasta y guionista Vargas cuenta una historia triste que llama la atención a la atemporalidad de la lucha eterna contra la injusticia. Mezclando episodios brutales (la chocante primera escena sobre la tortura y la violación) con momentos líricos (la impecable toma de seguimiento alrededor de la holguera de campamento donde el abuelo trata de explicar la presencia del mal en el mundo a su nieto) en una especie de corrido visual, Vargas logra encontrar el punto medio entre un documental e una obra más poética.